To celebrate my first week at my new job (which went very well, of course), as well as the fact that it was a long weekend, what else would we do but go sailing? 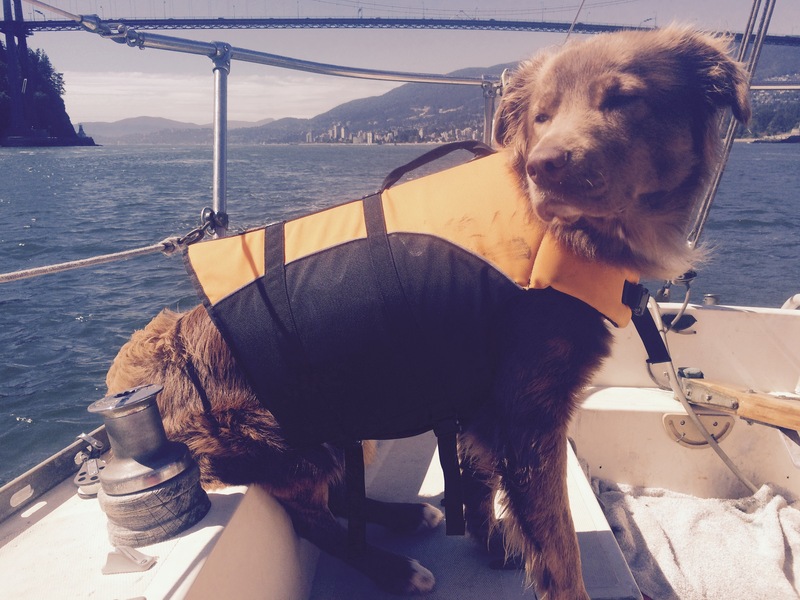 After the past couple of weeks, we really wanted to get out on the water and just SAIL! We had friends visiting Saturday night, so decided that we would take them out to English Bay to watch the end of the fireworks competition (the same event that started when we were stranded there the weekend before). Our motor was still at the mechanic’s, but another sailor had given us his old one. We had gotten it checked out, and were ready to go. It probably shouldn’t be a surprise that we once again had motor issues while in the narrows, but at least this time we still had some power and could return home safely. After fiddling around with it, we couldn’t find anything major, other than cleaning out the fuel filter. Once again, we had a decision to make: stay at the dock and just have a nice dinner with friends, or take a chance and try to make it out to the fireworks. Since they were up for the adventure, we decided to give it a shot. 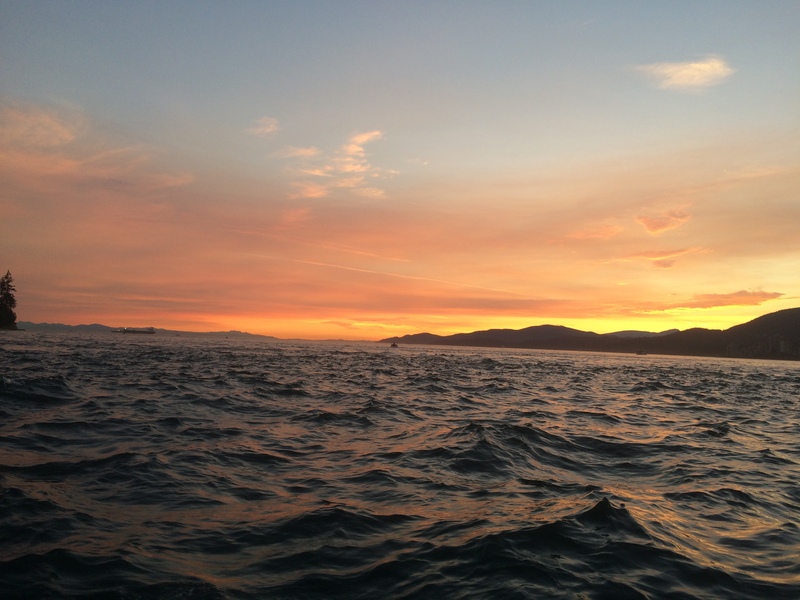 We timed our departure to have the optimal tide situation, so that it would ease the demand on the pressure on the motor, and literally sailed off into the sunset. We made it just in time to anchor and watch the fireworks. Unfortunately, the bay was incredibly busy, and we were anchored fairly far out. This made for a rather rough night, and no one slept very well. The next morning, Alex did his usual routine of Lenny and food excursion, and took our friends back into shore. 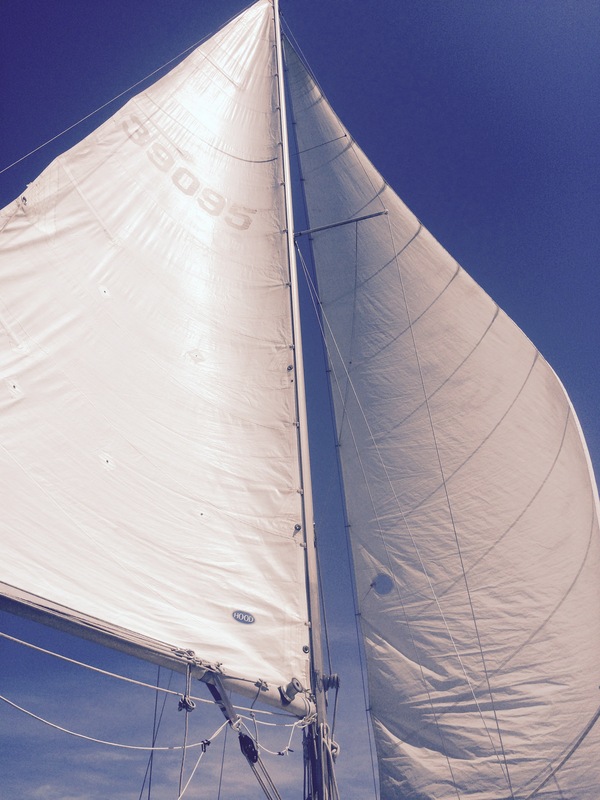 Once he was back, we decided to make the most of some optimal wind conditions and headed out for a sail. 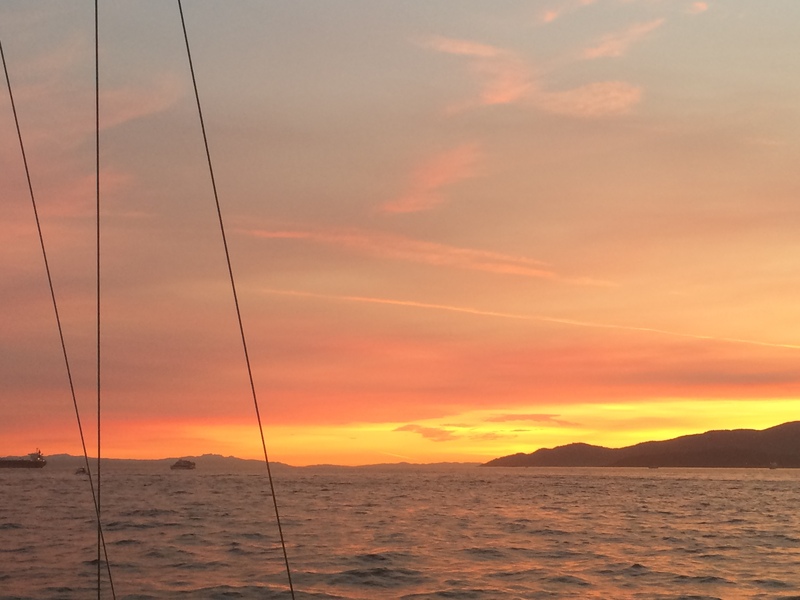 It was one of the most perfect afternoons of sailing we have had, but had to make the decision of whether we tried to anchor some place new (and further away), or headed back to English Bay for another night. 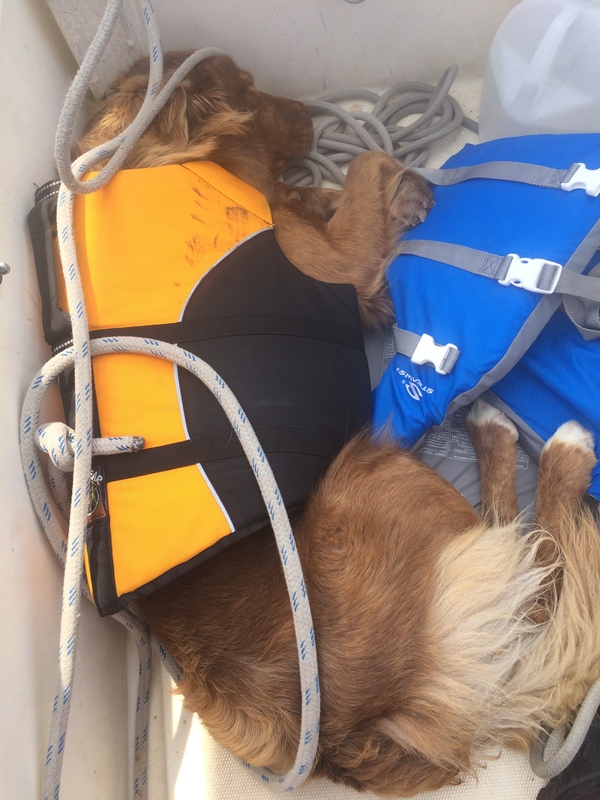 Given our recent luck, as well as the lack of a reliable motor, we decided to play it safe and stay in familiar water and anchor close to home. We made it back in time to relax for a bit and for Lenny to have a play in the dog park. 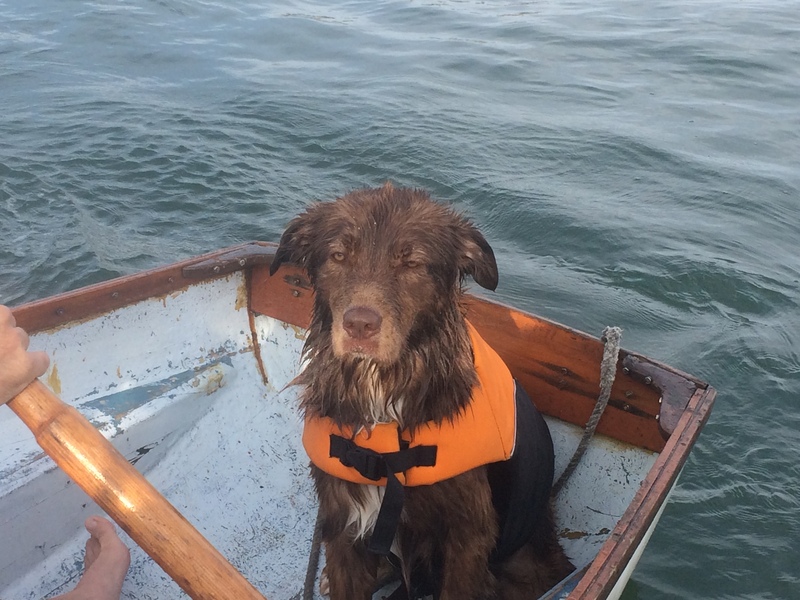 As per usual, he made a new best friend and did NOT want to come back to the boat. 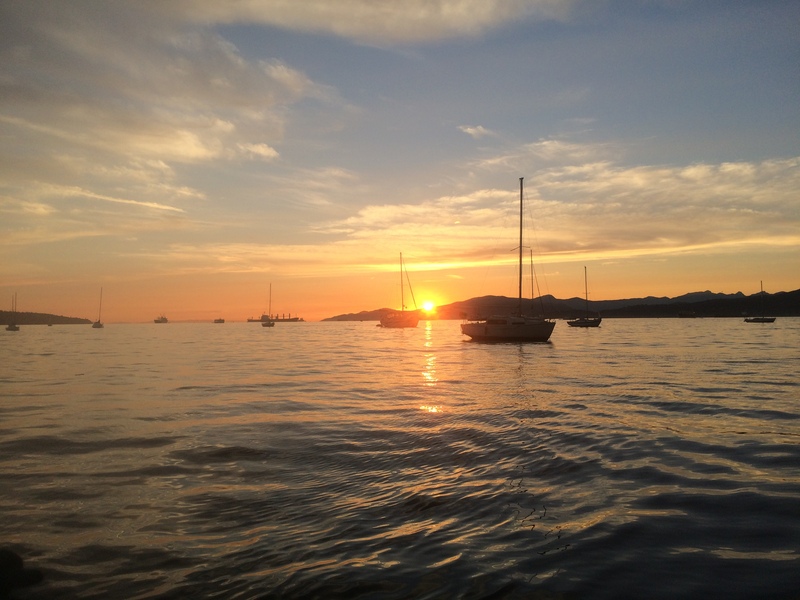 We had a nice dinner cooked on our new marine BBQ, then watched yet another sunset (I know, we have a tough life!). Monday morning we woke up to yet another day of ideal wind conditions, along with a tide that was timed perfectly for another afternoon of sailing. The sun was out, the wind was perfect, and we couldn’t ask for more! There is nothing like feeling the power of the wind as the boat heels and flies over the water. We were having so much fun that we decided to get adventurous. We had heard of sailing ‘wing and wing’, where the main sail and the jib sail are on opposite sides of the boat. This only works when sailing downwind, and is something we have been wanting to try. In this position, the sails are far more finicky but the satisfaction was worth the effort! It is definitely something that we will experiment with more when the wind allows. 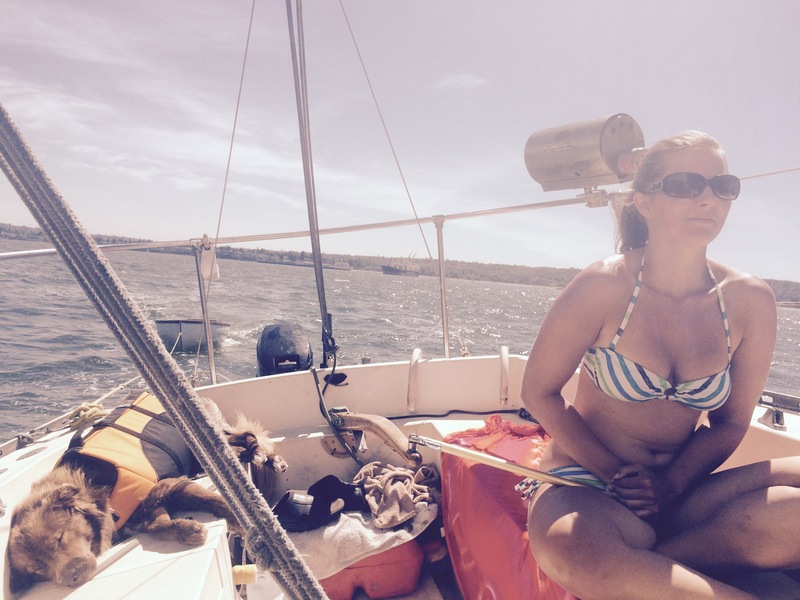 It was such a perfect weekend for sailing, and it really reminded us just how incredible our lives are. Even Lenny is starting to appreciate how lucky he is!